Designed with a clear vision of a modern and attractive lifestyle, the premium, beautifully designed two and three bedroom sky-homes and terrace homes at Pavilions bear the distinctive Mirvac mark of quality. 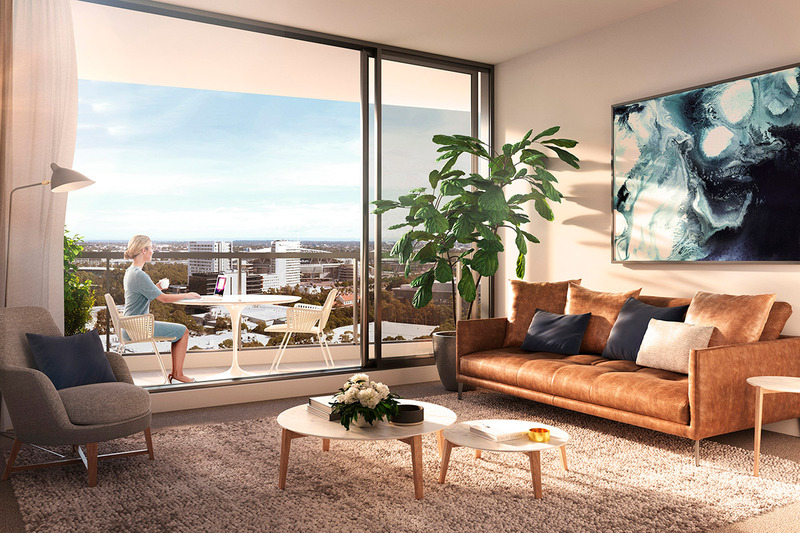 Positioned at the gateway of Sydney Olympic Park’s vibrant new town centre, Pavilions is the first residential development to call the new Sydney Olympic Park central precinct its home. As such, Pavilions has spurred great interest from those looking to live or invest in the new area that bridges Sydney CBD and Parramatta CBD. Behind the design, development and build is multi-award-winning Australian company Mirvac. Their unique in-house capability covering the entire development spectrum has made them experts in creating exceptional living experiences through the pursuit of quality and care in every little detail. The material choices and building forms for Pavilions, which consists of four highly articulated buildings ranging from 9 to 35 storeys, were inspired by the site’s natural surroundings. The 430 hectares of parkland, including the magnificent Moreton Bay figs which have been preserved, are beautifully mirrored in the architecture while also serving as a backyard for residents to enjoy. Pavilions comprises a total of 705 apartments. 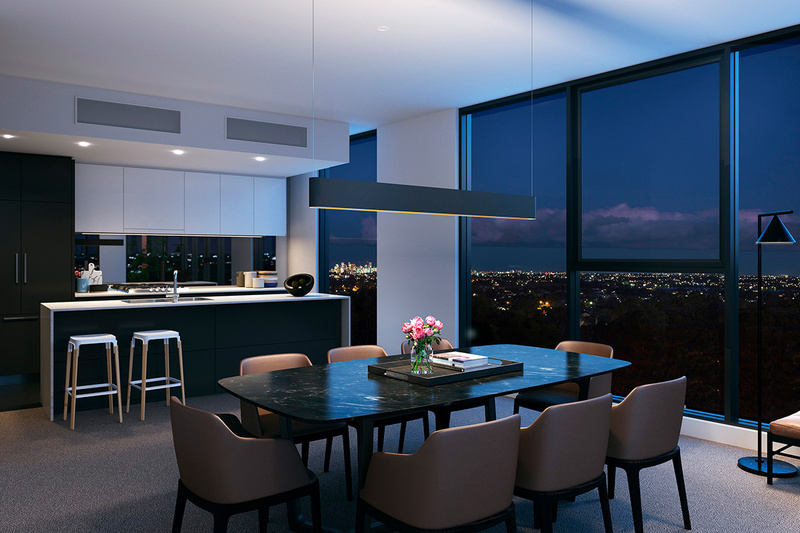 The diversity of the residences, including sky-homes and terrace homes, is designed to appeal to a wide range of audiences, from first home buyers to families. The remaining handful of premium apartments are in hot demand. The top three levels will house the popular sky-homes, complete with premium finishes as standard and delivering sensational views to the city, Blue Mountains and district. The interiors are designed to be not only beautiful but also functional and enduring. With large, open-plan living spaces spilling out to generous balconies, a fluid and effortlessly modern lifestyle is made possible. Buyers will be able to select kitchens, bathrooms and floor coverings in two sophisticated colour schemes – warm neutrals or darker grey tones. Sky-home kitchen finishes include Miele appliances, polyurethane cabinetry, mirrored splashbacks, marble-look reconstituted stone benchtops with a waterfall edge and a fully integrated fridge. Bathrooms include large overhead mirrored cabinets, frameless glass showers and a floor-to-ceiling feature panel. Facilities on site to be enjoyed include a community room, gym, barbecue, bocce lawn and play area for children, enhancing your lifestyle at Pavilions immensely. Residents will also have easy access to Olympic Park’s world-class fitness, leisure and recreational facilities, and an established town centre with a delicious range of places to eat as well as some great bars. More than 1,000 bicycle parking spaces will be provided for residents, making it easy to take advantage of the many kilometres of bike trails at Sydney Olympic Park. The Australian Government is set to invest heavily in the area on infrastructure that will include the South West Metro rail line, new schools for young families and plenty of parks for locals to enjoy. The master plan for 2030 will also provide 10,700 new homes and create opportunities for 34,000 jobs. 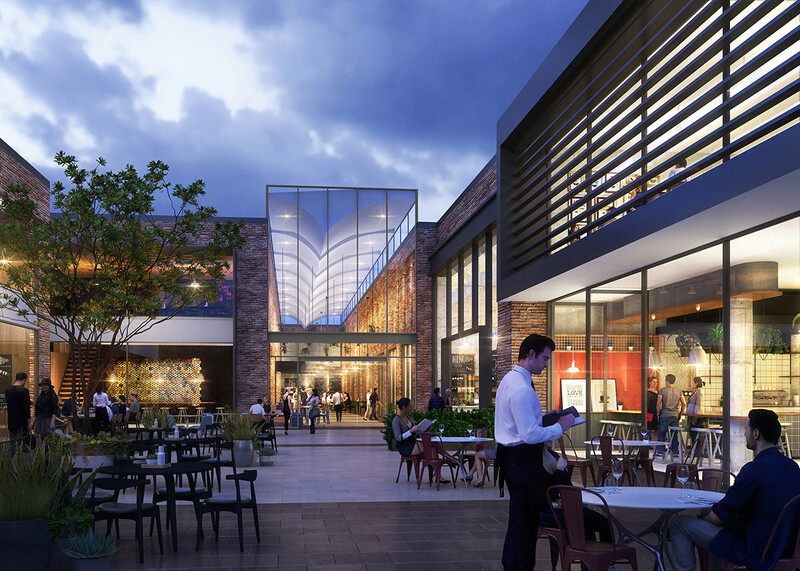 To cater to the new and growing community on the Olympic peninsula, a new 100,000 square metre retail space will be introduced, enhancing the shopping possibilities greatly for Pavilions residents. In addition, a vibrant entertainment hub will be built to support Sydney Olympic Park’s major venues including ANZ Stadium, Qudos Bank Arena and Sydney Showground. Residents of Pavilions will be able to take advantage of a plethora of new possibilities as the surrounding community continues to develop and grow into an attractive neighbourhood both for living and investing in. For more information or to enquire about Pavilions, click here. Discover more off the plan apartments in NSW here.